Personally, I really don't like having bits and pieces of paper lying around (even if they're organized by color in a binder) especially if most of them have been around since 2003. I thought I'm going to use them all up before I buy anything new. I think I'm making a headway in terms of clearing my scraps out. Although, this year, it became sort of necessary to buy new papers for new orders as it should be. 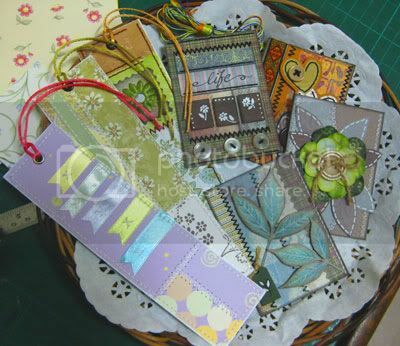 Anyway, here are some of the things I did with the scraps. 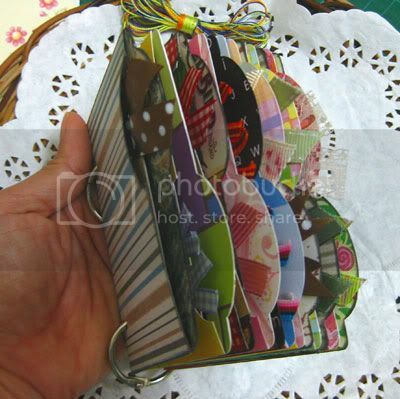 This is a modified file folder mini-album. Actually, this was inspired a bit by this YouTube video of Marion Smith. I don't have those envelopes from junk mails nor do I want to use new ones but what I had were big scraps that I could cut down using a file folder template I did. 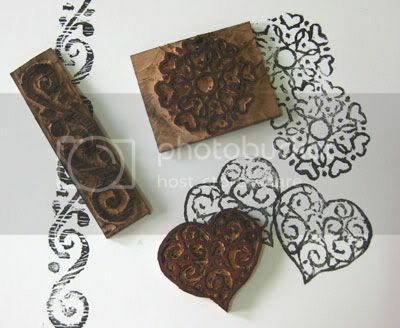 Some of the scraps were double-sided patterned cardstock. Some, I glued lining inside. 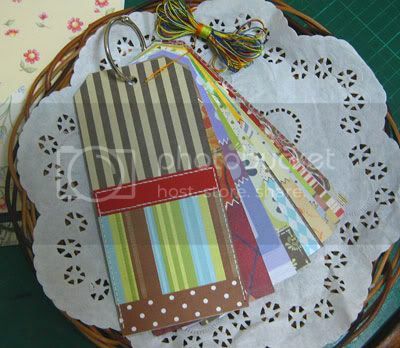 Some of the ribbons were scraps and the tags inside were made from a kraft folder left over by my niece from her project. Some were used for bookmarks and artist trading cards I have no one to swap with as I don't belong to any group. Although, I could swap again with the awesome Chris Palmer. And I have punched quite a lot of little circles and squares and did a lot of bristol board buttons which I like more than chipboard ones since it has a white core. My nieces had already used some of those scraps. And I still have a lot of them remaining!! What else could I do with them? Serenity squares? Heh. Because honestly, I want to replace my stash already. I don't want to be saddled with stuff anymore than I can use. It's been awhile! While I resolved to post things as often as I could, I find myself writing less. Why is that? 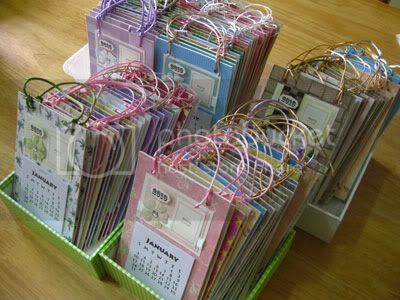 Anyway, a friend ordered 100 pieces of 2010 calendars for Christmas along with 5 notepads with hard cover that I'm going to start doing by Thursday. I'm telling you now, they're really a lot! But they're so much fun to make and early orders are always, always easy to deal with and very much appreciated. Yesterday, I delivered a coptic-bound scrapbook album with pre-made pages to another friend. I think I really did well on that one. :) Sadly, I didn't take a picture. :( There's another one for December so I'm going to make an effort to remember to take its photo. There's a project I've been doing for the past few months. You might think that it's really huge. Not really. It's just a 4" x 8" (plywood size) bulletin board that would go up a clinic wall. It's really a cool project. That board would hold up hundreds of photos of children who are patients of my pediatrician friend. She said, they're her pride and joy aside from her own. Cutting up the photos took a lot of time. Then there's the matter of finding a 1/2" or 3/4" thick cork board (we haven't found any! ), but we ended up using the ordinary 1/4" ones. My furniture-maker did not disappoint! They're going to deliver that to the clinic on Thursday where it's going to be painted a deep, deep brown, the same color as the trims in that room. I can't believe it! I've been doing bulletin boards almost my entire life! And I'm doing some projects to get rid of my scraps I've had since 2003. Geez! Some of those papers I ordered through eBay or some Canadian firm because nothing was available here at that time... or at least, nothing I knew of. I'll post them next time. Yes, before October ends! So, that's it for now and see you later! I should be starting posting projects, shouldn't I? I'm still up to my elbows in 2010 calendars, I can't see straight. In the meantime, let me talk about white inks and gel pens. 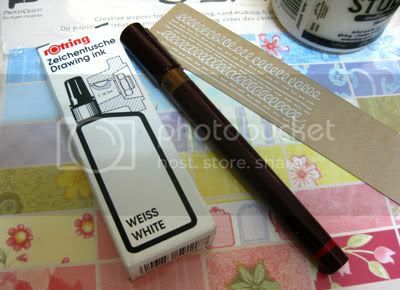 I know how most everyone in the scrapbooking and card making world loves our white gel pens. It gives an extra 'oomph' to our projects. But if you're like me and having all kinds of frustration about accessibility to it (read: I need it now! No time to order! ), this is a perfect solution. Any town with a technical school/college/university is most likely to have a school supplies store that sells technical pens and drawing ink. For me, I've always been a Rotring user so this is what I have. Other brands are also available such as Staedtler and Faber-Castell. The best part of it is, Rotring also have white drawing ink (and other colors like black, brown, yellow, blue, red) which you can buy for only Php100 and will go a long, long, long way. A few drops into the ink cartridge of the technical pen and it's good to go for awhile. Gel pens sell for about Php160 each. So, even if technical pens cost much more (about Php450 each, depending on point size), it's still cost-effective in the end because you only have to buy the ink when you're finished with a bottle. And you'll get different thicknesses if you're up to buying those college sets (includes three technical pens, ink, pencil and white rubber eraser in a set). So, how long does a bottle of Rotring ink last? Look at it this way. A comic book's original size is 11" x 17". Now for a 22-page comic book that uses a lot of black ink, it only consumes about half a bottle of the same size. Warning, though. Never use white ink on technical pens with sizes .10, .20 or .30. I would suggest that you start with .50 like the one I used above or thicker. White ink has the tendency to clog smaller sized pens and you'll have difficulty cleaning it. I lost a couple of .10 in my lifetime to white ink gunk. That's my first tip in October and I hope it helps. I really should start posting projects. All I post are tips.